"The University of Minnesota maintained records and summarized the net profit or loss for heifers sold during a developmental period during a three-year period. Heifers culled on the basis of pelvic area, average daily gain, reproductive tract scores, disposition, or structural soundness at the time of the prebreeding exams and finished in a feedlot had a 3-year average net profit of $9, whereas heifers diagnosed as nonpregnant shortly after the breeding season were sold for a net loss of $86. The loss for pregnant heifers that were then diagnosed nonpregnant after wintering on native pasture and sold at a sale barn was $133." "These figures indicate the importance of identifying heifers that will not breed during the breeding season and culling those heifers before they become an economic liability. Heifers that were diagnosed pregnant during the breeding season were allocated to three groups: first-service AI, second-service AI, or natural mating. Average profits were $163 for first-service AI heifers, $139 for second-service heifers, and $83 for heifers naturally mated. These figures take into account all synchronization costs." "Therefore, the advantage of AI over natural mating is certainly evident from these analyses, but without sound data these results could not have been noticed. In fact, many people would (and still do) shy away from AI because of the initial costs associated with synchronization, management, and an AI technician. Nonetheless, these results would encourage a producer to seriously consider AI, realizing that the profit potential is far greater than just using natural mating. Net Profit or Loss Associated with the Sale of Heifers at Various Stages of Reproduction . . . follow the link in the article title above for the remainder of the cost analysis provided by this Cattle Network article. Curious, you are a breeder, no? Do you also finish beef for sale (retail cuts or wholes/halves)? If not, do you know of some who do? 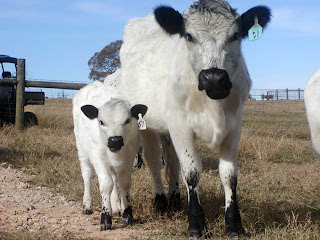 I could be interesting to include British White Cattle in my artisan steak and burger tastings. Thanks!